If you caught the second hour of the Aquarium Drunkard show, on SIRIUS, this past Friday, you no doubt heard my special guests, Le Switch, doing an exclusive A.D. session here in Los Angeles. Here are four of the nine tracks that aired on the show. 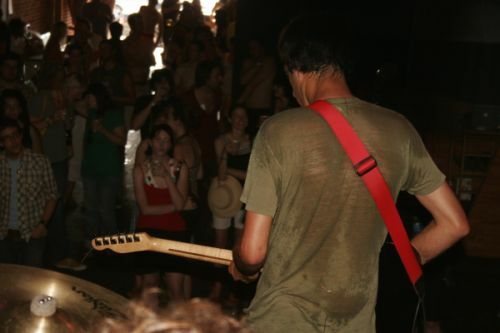 Photo: Le Switch play the Little Radio summer camp kickoff, June 2007. Photo by Jenn Needleman. I love the roughness of their sound; the tension. The vocals are so punkrock at times.